Simply one of the coolest looking grasses we’ve carried. In the tradition of the Japanese Forest grasses, its cascading foliage spills out beautifully and offers amazing colours throughout the season. 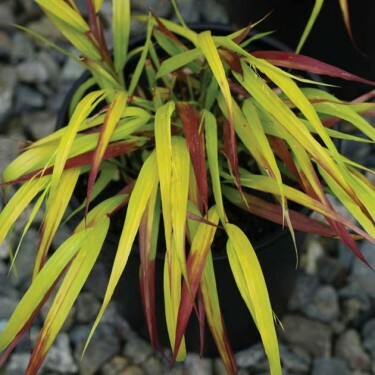 Commonly known as Golden Japanese forest grass 'Sunflare' is a compact variety that produces golden leaves with subtle tones of burnt orange and burgundy red. It offers a graceful growth habit and high impact colour. ) We recommend growing it the dappled shade of a woodland or beside a stream, at the front of the perennial border or in containers.